What is the name of the small containers of half & half, etc.? Does anyone know what the word/name for the small plastic cup things that contain liquids (like half and half for coffee) is? Right now I’m using sachet because a coworker started to do so, but I’ve never heard them being called that (looked it up and apparently it's legit). I’ve thought of packets but I feel like there might be a proper word for it. Also, what do people call it in everyday usage? I don’t drink coffee so I’ve never really had to think about it. I have heard these things called creamers, probably in reference to the non-disposable variety. At least one maker calls them singles – short for single-serving, I presume. That said, in that case, I'd say single refers to the name of the product, not the container. However, I might call it a single-sized creamer, or a disposable creamer. However, if a company were to put, say, soy sauce in the same container, I don't think creamer cup would be apt for that. Seems it seems as if you are looking for a word that would have people understand what you mean, regardless of whether there is actually a technical word for it, I will say that I have heard them called mini-tubs or just miniature tubs. Since cup seems to me generally to imply a handle, tub is better in my mind. would therefore be my vote. 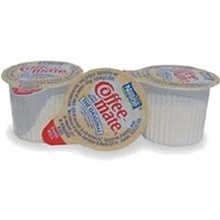 Like you, I think of the contents and not the container when I heard creamer. How many creams do you want? Can I have three creams, please? In a coffee shop or café you would ask for cream to go. Most coffee and donut places will have both the cream to go and a large quart of half-and-half. If they run out, just ask for half-and-half or cream to go. The small container is mainly a cup of cream for travelers. These are called creamers in restaurants in English Canada, when they are referred to at all (most people would just ask for milk). If you used any of the other terms being bandied about in this thread, e.g. mini tubs, no server would know what you were talking about. No opinion in other contexts, including in French Canada, industrial or other countries, because I have no specific experience. Apparently, one name used for those (in Britain, at least) is "jiggers" (see Google Images). The only related definition of jigger I know is as a shot measure for alcoholic drinks. I can't say it's a term I've heard used, but one company has even branded themselves as MilkJiggers.com. In New Zealand there is a 'pottle' which is a circular lidded plastic container of about, oh 300-400 mls capacity. Fruit salad or berries, and take-away salads are often sold in such containers. According to the wikipedia entry for 'half and half' accessed today (Sep 28, 2017), they are called milkettes. Word for something which is “on the side” or manifests “at the edge”? How to describe efficient usage of coins/notes?